The configuration with multiple holes had me stumped. This section of the Reformatory Branch was built in 1879 and extended the Middlesex Central RR 2.5 miles further from Lowell Road in Concord, MA to the state prison (reformatory) located by today's Route 2. From Lowell Road trains crossed the Sudbury River, passed behind Egg Rock, and crossed the Assabet en route to Reformatory Station. Trains operated over the line until 1927 when service beyond the Sudbury River was discontinued. An article in the Spring 1980 Boston & Maine (RR) Bulletin by Harold I. Judkins provided the author's memories of the rail line around 1900 when he lived adjacent to Reformatory Station. Harold mentions that "twice a month a coal train with about 20 four-wheel link and pin dump cars used to run inside the prison". The two unused holes and notch can be seen at the outward part of the coupler (known as the "knuckle"). The above photo was found on Wikipedia and shows a 1894 advertisement. 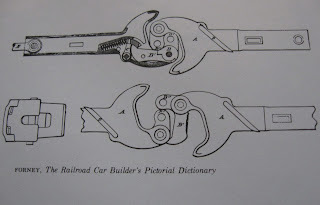 If connected to a link and pin car, the link would pass through the notch and then a pin would drop down through the two holes to retain it. It's said that by about 1900 the transition was complete and they stopped making knuckles with the notch and extra holes which greatly strengthened the knuckle in the process. When I first handled this piece I assumed it was cast iron. I now understand that cast iron would have been too brittle and that this piece was more likely made of cast steel. 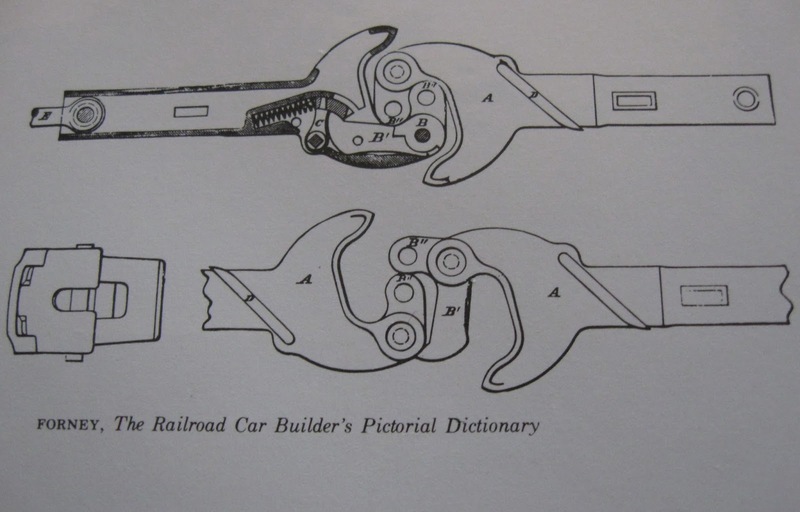 A chart of the many types of knuckles manufactured can be found on page 570 in the American Railroad Passenger Car part 2 by John H. White. I believe mine was manufactured in Depew, NY by the Gould Coupler Co. and originally weighed 38 lbs. I'd guess it was in the Assabet River for about 100 years. 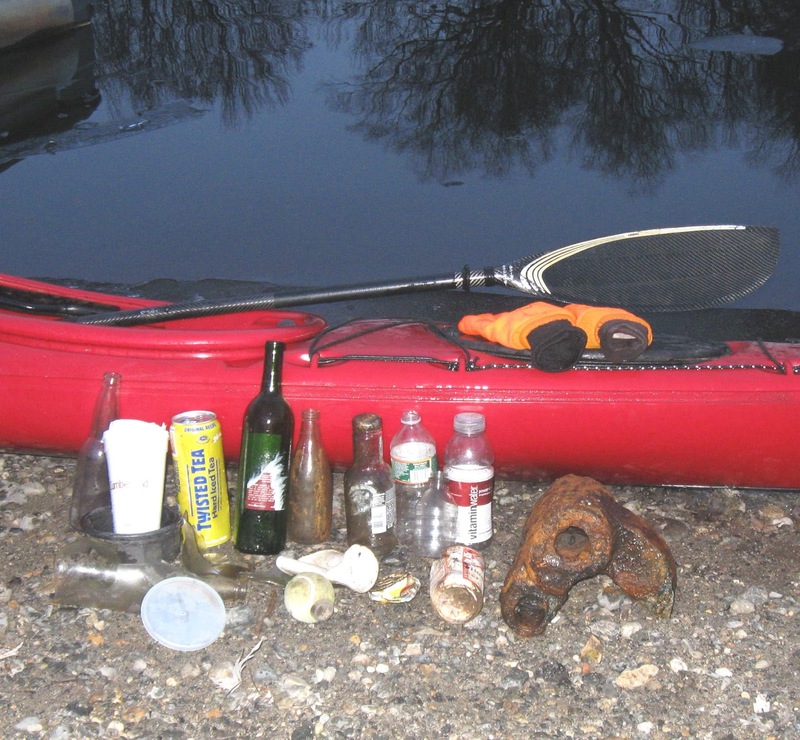 So I guess everything found in the river has a story to tell even if it is a long time in the telling. Pretty cool - great bit of investigating. How is the shoulder doing? Thanks Erik. My shoulder is slowly improving. Should have got the one made of malleable steel. Haven't tested it paddling yet but when I do so might bring ping-pong paddles with me to keep things on a lower arc, if necessary. Hope you had a good Thanksgiving.